Green Fees: £12.50 per 9 holes. Monday and Tuesday pay for 9 and play 18! At present there are 9 spectacular holes open, with a total yardage of 3173, and on course to have the second 9 open in the spring of 2011. There are also advanced plans for a clubhouse with all the facilities you expect from a traditonal club and more. In 2008 the construction of the front nine holes of the golf course commenced on a fantastic chalk based site ten minutes from the centre of Guildford. 2009 saw the construction of the back nine. To further improve the base, where there was no chalk primarily around the quarry, thousands of tons of chalk was excavated and those areas capped, thereby ensuring consistancy of playing surface and drainage. Above and beyond this, massive amounts of earth moving took place to create great golf holes. Three large teeing areas per hole, huge greens with tantalising slopes and the brand new Sportcrete bunker system. In essence the course is made up of two loops of nine hole golf, built and maintained to a condition equal to the very best private members club. Time is of the essence today, and for many a two hour walk in the park hitting that little white ball is all we've got time for. Clandon Golf recognises this. The concept of Clandon Golf is to provide a high quality, low price, easy access golf experience. It is designed for all levels of golfer. Clandon Golf is NOT your 'traditional' Golf Club and therefore we have no membership base. Also, unlike traditional golf clubs, we do not have a strict dress code recognising that casual elegance is part and parcel of todays lifestyle. What we do demand is respect for our golfing environment and for the game of golf and its rules. Please replace divots on the fairways and pitch marks on the greens. Please also maintain a steady pace of play. Bookings and payments can made online via the web or on site at the clubhouse with cash or card. To book online you must first register. Once registered you will be taken to your personal home page. From here you can select the date and time you wish to play and then book your tee time. Booking online guarantees your time especially at weekends. You can book for yourself and three other playing partners. All payments are made at the time of booking through secure Googlepay. Once you have made your booking a confirmation booking email will be sent through to you. This will contain a unique booking reference. Please bring this with you when you come to play. On arrival you will need to check in via our self service kiosks. Once checked in you can then go play golf. PLEASE NOTE that this is just a temporary card to record scores for playing the front 9 holes twice, so the stroke indexes on the "back 9" have been made up to allow a card to be entered. I wasn't sure what to expect at Clandon Golf as upon arrival the portacabin isn't great but everyone was very friendly and welcoming. The course offers nice wide fairways so no matter how wayward your drive it's easy to find your ball. The greens looked terrible but played true! The back nine has some terrific holes which need to be played a second time to get right. Drains very well so a good winter course. Clandon GC is a proprietary pay and pay course in Clandon, near Guildford, Surrey. It is located immediately behind a Park & Ride bus station. The course is described as a parkland style course but the course is very akin to an inland links style course in places! 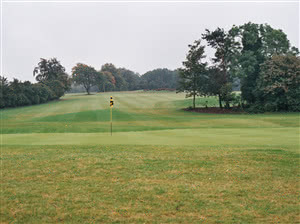 The course opened as an 18 hole course in 2010. The front 9 was built in 2008 and the back 9 in 2009. The design of the course is accredited to European Golf Design, a partnership of the European Tour and IMG Design. No named individual designer is identified though the design company has a celebrated portfolio of completed courses! The course is a short par 69 at only 5,672 yards off the Yellow tees!There are 5 par 3s, 11 par 4s and 2 par 5s. The course is built on a chalk base so all round playability is claimed. I/we played it in mid December and despite recent rains, the fairways, banks, bunkers and greens were in relatively 'dry' conditions. Very playable! The rough areas were cut to make it easier to locate and play wayward drives/shots! The greens were firm, generally large and undulating and difficult to read pace and line, as evidenced by 4 triple putts on the day! A few greens were patchy and perhaps infected but nevertheless played well! Bunkers are numerous, large, deep and well sanded. The standard weekday green fee is £18. However, an over 60s rate of £13 is available on Thursdays! An excellent vfm option for us vets! The course is administered from a port-a-cabin type arrangement. Adjacent to this is a basic kitchen/dining area. Hot food was not scheduled to be available on Mondays, but due to a society booking the kitchen was open for hot food. I had a nice pre-game toasted fried egg sandwich! Catering availability finishes at about 13.30pm. There is however a coffee/tea machine and sandwiches and confectionery available. I first played the course a couple of times in 2012 but hadn't played it since largely due to a 'prejudice' about the lack of 'proper' facilities; particularly the absence of decent post game refreshment options. There is no alcohol licence held so no beers available! We finished in time top have a post game coffee but nothing else! Back in 2012 I though the general design/layout of the course was good, with many challenging holes, risk/reward choices to make and 5 lovely par 3s. My concern was always that I couldn't be certain, based on a perception of lower utilisation/revenues, that the course maintenance would be poorer. However, on this occasion my previously held view was unjustified. The course was infinitely in better playing condition throughout than many pay and pay and members courses I've recently played. While I generally look to play 'new' green fee courses during the winter months outside of my Cherry Lodge play, I'd have no reservations about playing here again on an ad-hoc basis, especially on the Thursdays seniors rate. In current weather conditions this course is worth a visit. Dry fairways and greens. No mud ! I can't really score this to improve the rating, as the fairways and tee boxes hadn't really improved since my visit here 4 years previous. But the greens did seem a bit better, and were in most cases quite firm and fast. However, some were still suffering from patches of moss growth. I think it's really a course in the winter where you would trade off quality, for the chance to get some golf on a course where you'll still get some run, and your ball won't plug on virtually every shot, as has been the case on the last two courses I have played following the recent heavy rains. No doubt helped by it's higher geographical location, and the chalk base, it was holding up really well, and does have a few really interesting holes, and some great views. Pity it still hasn't had any investment, and there is only still a portakabin, but the service was friendly, and there was tea/coffee/rolls and a loo available. We were only charged £20.00, I think I would begrudge paying more, but overall we were able to play a round of golf here, whereas most other local courses were in quite saturated conditions and bordering on being unplayable. As another of our party has said it will likely be sold off for re-development, I can't see it getting any better, so would probably only go back to take advantage of the drier conditions in similar winter circumstances. Clandon which I discovered a few years was a great course which unfortunately went downhill a bit if you read some previous reviews. I wanted to find out for myself the condition in 2016 and I must say I was nicely surprised by the quality of the fairways and the greens were very decent. One or two has a little moss, the downside was that pitch marks were not repaired. What sort of golfer would do that? Shame on you, if you play golf you should know to respect such beautiful places. The bunkers were excellent due to their specific construction, I only visited one. A pleasant round in a 4 balls despite a little rain on 8th/9th hole, a lot of ferocious wind. The 13th, 14th, 15th are the most challenging and enjoyable. The welcome is warm even if in a portacabin. Hot food & beverage available and extremely reasonable, and one can have the after golf drink in a delightful local pub, The Onslow Arms in West Clandon with a 20% discount. The car park can be a little tricky to find and mud can play havoc when you drive in or get out, some of us had a very unfortunate experience but a happy ending...... Won't mention names. Will return sooner than later as I believe the site is on the list for future development.